Is Alice coming to Fanciful, Arizona this year? It's been ever so hot, and although I long for a tea party, I simply couldn't find the perfect time. And plus, I couldn't feel Alice wanting to come out and play. Normally I get a jolt of inspiration for my tea parties just like I do for my art. I never know when it's coming, it just appears. But it's been sooooo hot, too hot for a tea party. And while I normally host in crazy heat, this year has been more intense temps. Like 115'F & pure sun. And so, I wondered if Alice would turn up for our 10th annual tea party? Slowly, characters started to appear just after that wondering. I roam antique stores, quietly unknowing, what will speak to me? And yet, outside, still too crazy hot. I woke up one morning recently, unable to hit the hills because for some reason the heat is really wiping me out this year. If I don't wake up early enough I have to wait until evening to do anything outside. Walked into my cool studio and sketched on the blank canvas. Mister Fancy pants sang in the background. And in one hour, there she was on a large canvas. It's okay, have your party any time. Be free, be you, do what makes you happy. If you make art too, then you understand. Your art tells you what to do. Your answer will reveal itself. You explode in so many emotions when you paint, that when you are done, you have this beautiful clarity. Maybe not always like that, but some version close enough. A peace lives within the wave of creativity. Sweet Alice reminds me of so many good things. Of a whimsical heart, in the power of believing. Of fairytales and endless hope. How time stands still in that creative space. A portal to a place where everything magical lives. Your deepest dreams and heart waves meet you for tea any day. As for our annual tea party, I think we'll wait until it cools down. So, Alice and her friends say to wait until the time is right. I've gotten so many emails and messages asking about the parties. Alice is always there, so perhaps we'll wait until spring. But it doesn't mean we can't wear our fanciest frocks and partake in sweets. Not with all those tiny blossoms and pretty pastels fluttering about. We must always partake in the enchantment. Ask ourselves, what our heart wants. How hard we are on ourselves. How we think, if we get older or take a different journey for a while, that we have lost ourselves. I see so many friends feeling that way, as I have too in the past. It's a natural thing for sure. But, we are never lost. We are always there. We only think we are lost. I've been shown this soooo many times in my life. The space where your joy and magic lives is ageless. Just because you get older or grow up has no bearing on partaking in your youness. The question is, what do you have to do to get back in if you feel you've lost your way? If your muse feels lost, if you can't conjure up the frame of mind to create? You go to your canvas. To whatever it is that you love to do and makes you feel like you. And even if you can't create, you take yourself to that space and you allow yourself to feel whatever feelings come to you. If you feel sad and frustrated, you feel it. Sometimes you have to purge and release to get back to the place. Even taking yourself there is part of the journey to getting back. Maybe you won't paint/create that day at all. It's okay, you still broke a barrier. Even though you might not know it. The other thing is to create anything if you can. Creating is an exercise in sanity. It grounds you, you practice mindfulness and so many other things. Whether it be flinging paint, crocheting, dancing, sculpting, baking, cooking. Sometimes it's fun to be creative in a different medium, just to get the creative juices flowing. It's your creating that keeps you ageless and sane. All you have to do is plunge. This is a filter free unaltered image below. The sky did this the other night. And then I just knew, it was time to go for it! This hallloweeen, this is halloweeeeen! I know it's too soon for some of you, but fellow Halloween lovers, you get it, right? Halloween for me is a time filled with so many wonderful memories. All of our family would get involved. It reminds me of fairs with cotton candy and kettle corn. Sparkles and autumn crispness and laughter. Bobbing for apples and filling bowls with candy corn. Writing to you from a brand new computer & a crazy week. I sort of feel like I'm writing to you from a whole other universe on this machine. I've wanted to share a Nutcracker tale with you for ever so long. Finally, today is that day. 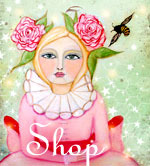 With new treats in my shop too. But first, here's the tale. The company (BPlusPrintworks) that I worked with on my ballerina giftware line asked me to do something fun this summer. They asked if I would consider illustrating characters inspired by The Nutcracker ballet. The illustrations would be used on some fun products for the ballet industry. I agreed and set off to watch The Nutcracker endless times. It became Christmas all summer. I just let The Nutcracker repeat in the background as I drew for months. I submitted my drawings, worked on edits and pretty soon things started to take shape. Clara and the Nutcracker grew very near and dear to my heart. As visions of sugar plum fairies really did dance through my head. Pretty soon I had 60 or more drawings to choose from. Then I spent another couple weeks adding color to all the drawings. After that I waited to see how they would be brought to life. Or what kind of products would be made. And then, I received some super sweet pieces. These are boxed notecards featuring some of my illustrations. I love the box they are in so much. There are also coffee/tea cups. I was so overjoyed and just smitten with these little delights. Then I was inspired to create a poster using all of the characters. So, I created this Nutcracker Sweet Poster for BPlus Printworks. They have sold out on the poster a couple of times, however I got my hands on a dozen which I popped into my shop. The price point is pretty amazing, but it's a vendor promo price that may not last, so do take a peek if you'd like one for yourself. Here's a better peek below at what the boxed notecards look like. They are great quality fold open cards. This is what the back of the box looks like. My camera was being finicky, sorry about the pic. There are also collectible pins as you can see below. And some super adorable 3" mirrors. These make such great gifts. I've bundled them into little gift sets in my shop. They turned out so crisp and clear. I'm so excited about how sweet the pieces turned out. I really couldn't be happier after a long drawing summer. I've had a bunch of things going on and been quite busy. I'm also trying to finish some sculptures and paintings while working on other projects. I have a few of all of these products in my shop. Not a ton, but a nice little smattering. You can get some right here. It feels like these officially kick off the holiday season. In my world at least. All my seasons sort of did a mashup this year. I'm trying to sort it out somehow in my mind, haha! Off I go for now. I'm so excited to finally get to share my giftware line with you! In fact it's in my shop now, right here. If you've been wondering what the heck I have been up to lately? The last couple years I've been working on some product licensing with the most wonderful folks over at B Plus Printworks. We have so many fun goodies coming to fruition. They've made some beautiful little treats with my ballerinas. Things like cosmetic bags, mini journals, glass magnet sets & playing cards. You can purchase them in my shop here beginning this morning. I am sooo in love with these little journals. Being a book lover, I just can't get enough of them. They are the perfect size to toss in your handbag and boy would they make wonderful stocking stuffers. 4 of my ballerina pieces have been used to create this line of products. The cosmetic bags are oil cloth on the outside & have a dreamy water color quality. Each bag has a beaded zipper pull. The cosmetic bags come in small and large sizes. There are also beautiful glass magnets that are packaged in lovely little boxes. The little journals include an elastic band and a satin ribbon bookmark. Inside they have 80 lined sheets of cream paper. And, my favorite part, a hidden pocket in the back for small keepsakes. They make me so so happy. It's a lovely combination of art and function I think. There are 4 styles, as you can see here. I love the silk bookmark and elastic band. The cosmetic bags are oil cloth on the outside and a red dotted fabric on the inside. You can see extended details of each product in my shop. Available in 4 ballerina styles as well. Oh and, must not forget the playing cards. These are soooo much fun and have the Theater of Dreams piece on them. The little box is cute too. I'm so pleased that I entrusted my art to a company that made such darling little treats and treasures. Pop on over to take a peek if you'd like. There are more details and photos over there. The sizes of all the items are so great for gifts and stocking stuffers. So that's some of what I've been up to. Finally getting to share is soooo exciting!! ps: If you'd like to shop for these you can pop into my shop here to purchase.